With early Spring just around the corner, we're approaching an ideal time to visit Harley Farms. During the birthing season in February and March, the farm is filled to the brim with dozens of adorable newborn goats. One morning last March I interviewed the farm's very busy founder, Dee Harley, for Became Today. Despite having just pulled an all-nighter attending to baby goat births, Dee was gracious, energetic, and practically glowing-- the love she has for her work is palpable, and incredibly inspiring. And the cute footage we captured of the newborn goats speaks for itself. Mark your calendars, because according to Dee's blog, birthing season 2011 is set to start again in just three weeks! 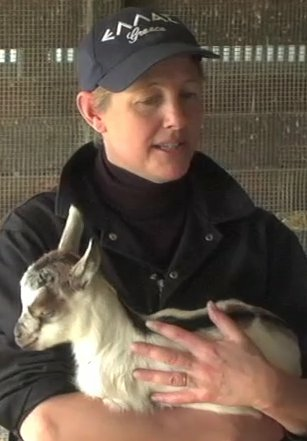 Once birthing starts, Harley Farms posts a daily baby goat count on its website, so it's very easy to plan a visit with optimal amounts of baby goat time.